Gregory Carpenter Gagne was born on November 12, 1961 in Fall River, Massachusetts. The shortstop was originally drafted by the A.L. New York team, in the 5th round of the 1979 draft. He was traded to the Minnesota Twins with Ron Davis in the Roy Smalley deal in April 1982. He peeked his head in the majors in 1983 getting a cup of coffee & driving in three runs in 27 at bats. By 1985 he would solidify himself as the Twins shortstop for the eight years, winning two World Championships. He proved to be one of the AL’s better fielding shortstops in that time, leading the league in fielding % (1993) put outs (1994) while coming in tops in most defensive categories during his playing time. He would also lead in errors at short twice (1986 & 1995). In October of 1986 he hit two inside the park HRs in the same inning, tying a modern day MLB record. Both came off Chicago’s Floyd Bannister at Minnesota’s Metro dome. In 1986 he hit 12 HRs with 12 stolen bases & a Twins career high 54 RBIs. 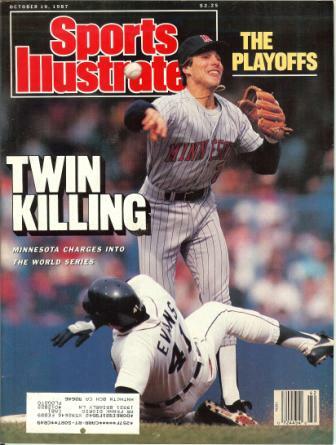 In the Twins 1987 Championship season he hit .265 with 7 triples 10 HRs & 40 RBIs. 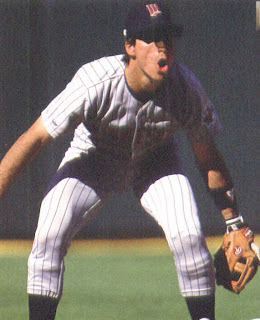 Post Season: In the 1987 ALCS, he hit a HR in Game #4, then another off Frank Tananna in Game #5, breaking a 1-1 tie in the 4th inning. Both HRs came in Detroit’s Tiger Stadium. In the World Series he hit another HR against St. Louis, driving in three runs in the Series overall. In 1988 he hit a career high 14 HRs stealing 15 bases, although he struck out a career high 110 times as well. 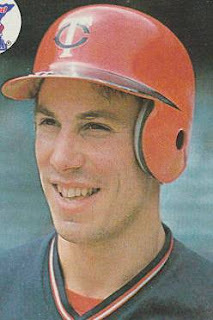 From 1986-1989 Gagne averaged six triples per season, totaling 26 overall. Post Season: In Game #1 of the 1991 World Series, Gagne hit a three run HR in the 6th inning off Atlanta’s Charlie Leibrandt at the Metro dome, giving Minnesota a 4-0 lead as they went on to win Game #1 & the Series. He struggled the rest of the Series only getting three more hits & batting .167 overall. After the 1992 season he signed on with the Royals for two seasons, having career highs in RBIs (57) & batting average (.280) in 1993. He closed out his final two seasons with the Dodgers batting .253 over two seasons there, retiring in 1997. In his 15 year career he played in 1798 games, batting .254 with 1440 hits 296 doubles 111 HRs 50 triples & 604 RBIs, while posting a .972 fielding percentage.